5 Key Transitional Pieces For Under £100! Autumn stock has now well and truly landed in stores and it's looking fabulous! If you feel like you need a few updates and don't want to spend a fortune, then check out my key pieces below which are available now, all for under £100! Covering print, colour and shape trends for AW 2012, I've chosen a few of the best items which can be worn now and through the season, which will update your look with style and practicality. Tile is the perfect print to transtion from summer to autumn. This gorgeous pair of burgundy cropped trousers executes both print and colour trends and will bring you bang up to date! 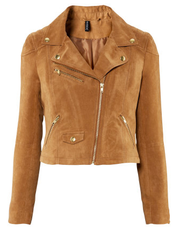 Earthy mid-brown tones are key for autumn winter 2012 and this suede biker styled jacket is so versatile as it can be dressed up or down - a fantastic price too! 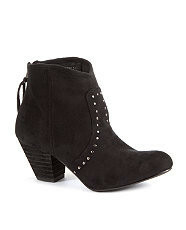 Embellishment is key this season and the studding detail brings these chunky heeled ankle boots right up to date. Instead of the usual animal printed scarf (which has been my best friend in the transitional months) go for something a bit different to finish off a plainer outfit. 'Creature' prints are huge for AW 2012 - owls, rabbits, birds, squirrels and this rabbit print scarf is an easy way to introduce this trend into your wardrobe. Gorgeous colours too! 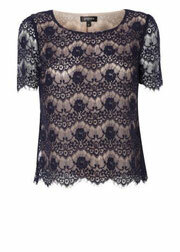 Lace is back for autumn and this fabulous top in beautiful ink blue will add a bit of glamour to your wardrobe. 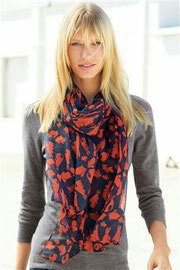 Wear with a pair of black skinnys or maybe splash out on a new pair of burgundy (key colour for AW 2012!) skinnys to be bang on trend!